The Sharkoon DarkGlider is the high-end model presented in Hannover under Sharkoon's gaming input devices. Under its ergonomically designed, secure-grip rubber cover in matte black sits the latest version of the ADNS-9500 LaserSensor Sensors. 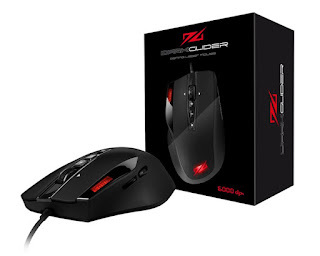 The mouse contains up to a 6,000 DPI resolution, 11,750 FPS frame rate, 30 G maximum acceleration, a millisecond response time and a maximum 5 mm liftoff distance as a very precise, reliable and responsive playmate. The DarkGlider glides on five lenticular ceramic feet, which cannot afford to support any significant sliding resistance. The DPI sampling rate can be arbitrarily set and read in the illuminated LED display. For comfortable control a total of ten keys are provided including two axis-scroll wheels and a DPI selector. All keys can be freely programmed using the enclosed software. The 256 kilobyte onboard memory provides room for up to five user profiles. Also through the software numerous other additional settings can be made, such as single DPI stages, mouse sensitivity, polling rate as well as the color, frequency and intensity of the mouse logo. For those who prefer a more discreet appearance, the illuminating logo can be turned off. The combat weight of the Sharkoon DarkGlider can be optimally adapted to the needs of the game thanks to the Weight Tuning System. Four weights fit into the appropriate slots, with four weights in both 3.1 and 3.7 grams being provided. The maximum weight of the mouse is 150 grams. In order to give the mouse strength and durability, Sharkoon has coated the 180 cm long connection cord with fabric, gold plated the USB plug and enclosed a set of interchangeable ceramic and Teflon glides. The enclosed high-quality fabric bag becomes a well-protected refuge for the mouse between its operation and transportation. For further questions, to request samples and/or photos, or other information please contact us or go to www.sharkoon.com.